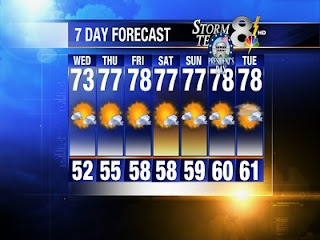 No rain at all in the forecast...and highest are all in the 70s. Woot! Hopefully the forecast stays true through the weekend! Last weekend was also good. It was a bit chilly when we started working around the garage/yard that I was bouncing around while I was cutting up boxes to keep me warm but that didn't last long. It stayed pretty much in the 60s throughout the day so it was really comfortable. It's only Tuesday but I'm already looking forward to the weekend only because of this great weather forecast. Well, not only that of course but it helps knowing the weather will be almost perfect...hehe.